Add dramatic height and fascinating interest to your garden with this stately spire of intriguing bloom. Make a bold statement in your borders with Eremurus 'Foxtail Lilies' - fully hardy yet exotic-looking perennials. Add height and interest to your garden with spectacular flowers from this large specimen. Spires of amazing burnt-orange blooms are long-lasting and impressive. Supplied as an established plant in a 4L pot to plant straight away for immediate, impressive plant size!. Make a bold statement in your borders this year and amaze your friends and neighbours with Eremurus 'Cleopatra', a fully hardy yet exotic-looking perennial for adding height and interest to your garden. Already grown to a large full-size plant for you, you don't have to wait years to appreciate the spectacular spires of bloom. 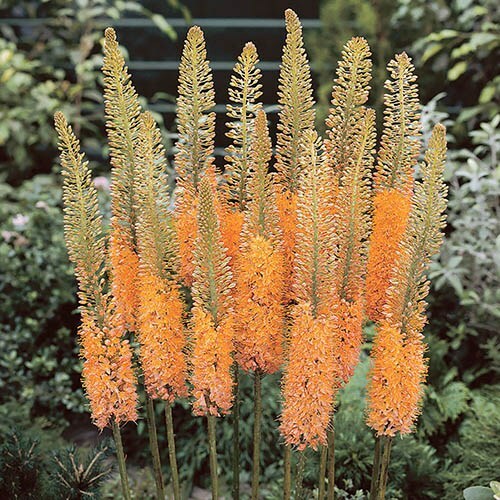 With mid-green lance-shaped leaves and dense flower spikes of striking burnt orange, the flower buds of this Foxtail Lily open a vibrant peach-orange with a dark red midrib. Also known as Desert Candles, the impressive orange flower spires are packed with star-shaped blooms, creating a bottlebrush effect. Backfill around the plant and firm in well. Water in to settle the soil and prevent desiccation.